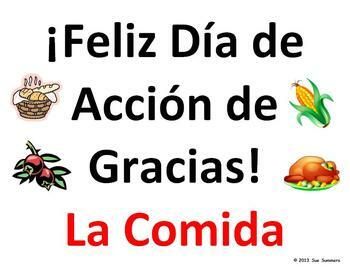 The Spanish Thanksgiving Food Word Wall includes 18 different common Thanksgiving food words with clip art images on 5 pages, plus a header page that says Feliz Dia de Accion de Gracias. 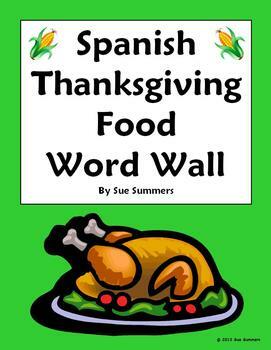 Vocabulary includes the Spanish words for turkey, stuffing, mashed potatoes, sweet potatoes, peas, green beans, corn, apple pie, pumpkin pie, milk, salad, dessert, rolls, vegetables, gravy, butter, bread and cranberries. Just print, laminate if desired and hang!